This superb video travelogue from filmmaker Vincent Urban is a wonderful example of why Japan is at the top of my list for places to visit next. As the video shows, Japan is such a vibrant country in a diversity of ways. The dichotomy, pitting old traditions against eccentric sub cultures, produces a unique and spirited cultural landscape. One that I hope to visit soon. Plus, I mean, they have the Ghibli Museum and crazy robot shows, so that alone would be worth the trip. Today, HBO released the most thorough look yet at the upcoming season of Game of Thrones, utilizing a bleak montage set to always depressing tune of Chris Issac’s ‘Wicked Game’ (performed by James Vincent McMorrow in this case) to bring us up to speed on our favorite Westeros denizens. Unsurprisingly, everyone looks about as good as you think they would, which is to say they look terrible. I’m trying to figure out which character is remotely close to actually being content in this trailer (happiness seems to be completely off the table at this point, so let’s just stick with contentedness). You could maybe argue that it’s Cersei. Even though Cersei’s world is wrecked, you can tell she’s going to enjoy getting revenge with her undead zombie Ser Robert Strong (aka more than likely the zombie Mountain). 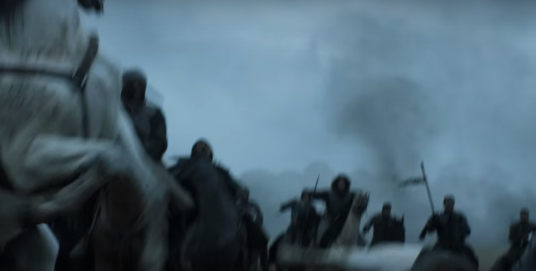 And not to dive too much into speculation, but even though we see confirmed dead Jon Snow shots, this screengrab of Davos appears to show him coming for Jon Snow’s body (more than likely to bring to Melisandre for revival purposes) and another screengrab shows what looks like a reanimated Jon Snow riding into battle. So….yeah. It’s also nice to see Bran and his new haircut back in the mix, even though it looks like he’s in a tough spot with the White Walkers. This season will definitely be an interesting one, as it marks the first time no one outside of the cast and showrunners will know what lies ahead. Devout book fans will no longer be able to lord the knowledge of future events over the poor souls who haven’t read the books. The playing field for fandom will be leveled and I think it will actually be a welcome change. Everyone can now just enjoy the show without having to worry about keeping any commentary spoiler free. Season 6 premieres April 24, 2016 on HBO.